Whether it’s helping you find the best talent for your company or partnering on research, we look forward to building connections that support your company’s success. 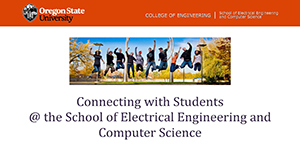 The School of Electrical Engineering and Computer Science at Oregon State focuses on research that has real-world impact and education experiences that are authentic and hands-on to educate the next generation of engineering leaders. We live for new discoveries, thrive on innovation and synergistic collaboration, and seek out organizations who share these interests. The Office of Corporate Relations is here to guide you in making connections, facilitate relationships, helping you engage with the School of EECS. Contact the EECS Office of Corporate Relations for help planning your next visit to EECS, arranging parking, and helping making sure your time at the School of EECS is productive. Need directions to the School of EECS? Interested in growing your organization's visibility on campus? Have questions about EECS events? Interested in partnering with our school? Want to connect with a researcher or research group? Need help finding the right contact? For an overview of our research areas, click here. The School of EECS is actively involved in commercialization and tech transfer — seven companies have been spun off of faculty research, and five new technologies have been licensed to external companies in just the last 10 years. You can be part of this! We are always looking for new partners and welcome your inquiries. Contact Tina Batten in EECS Corporate Relations and let us know your feedback and any areas of common interest.